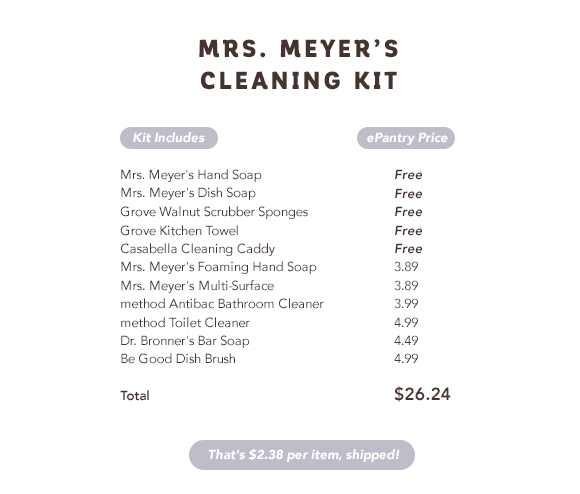 A few months ago I told you about ePantry and the great deal they were running with some free Mrs. Meyer’s products. Well, the deal is BACK and better than ever! Based on your answers, you’ll have some other suggested items added into your cart too–and of course you can change those to anything you’d like, as long as you spend $20 you qualify for the deal. 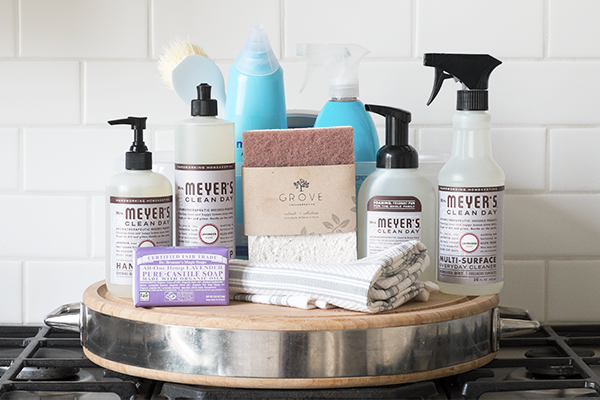 Don’t forget to change the scent of your Mrs. Meyer’s soaps to choose your favorites! 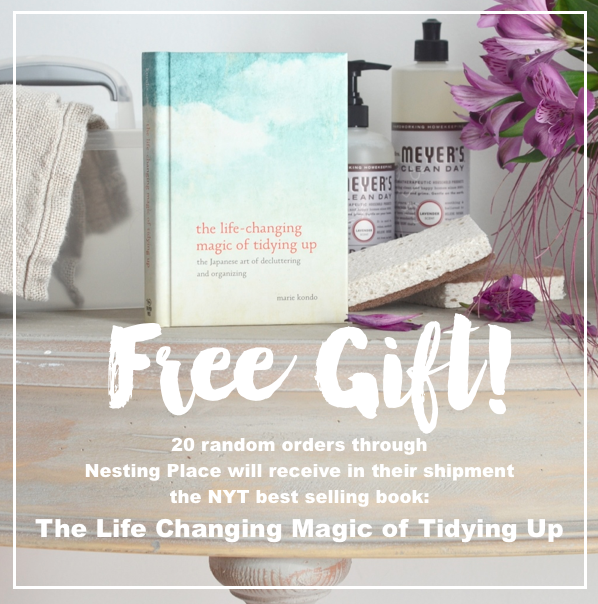 … because you are a dear Nesting Place reader and ePantry loves us, they asked if there was a book I’d like for them to give away randomly with 20 of the orders–I thought The Life Changing Magic of Tidying Up was pretty much the perfect fit. And of course, this is just a suggestion, you can change any of the items in your cart (just don’t remove the free ones!) and you can add any combination as long as the total is over $20. If you order, let me know if you are one of the lucky 20 with the surprise book in their shipment! PS, if you are wondering, I’m ordering more Grove Candles (blood orange!) along with the regular stuff we have delivered every month (paper products/cleaning supplies) saving me that dreaded $100 trip to Target where I come back with all sorts of things I didn’t mean to purchase. This offer ends this Friday, January 8th, with limited kits available, so click here to check it out now. oh I meant to mention that! SO SORRY!! That’s okay! We usually pay more in shipping but don’t often have no shipping here at all. Thanks for the promotion though….I enjoyed reading reviews on the sponges and cleaners! I hope you enjoy it! and I’m so happy you love the book!! PS, sofa picking out is SO hard, just remember, there’s never a perfect choice!! But I bet there are lots of great choices! Hope you like it all Tracy! 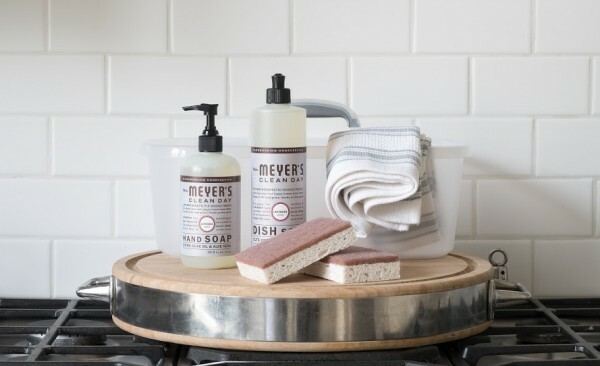 I love the Mrs. Meyer’s laundry stuff, in recent years, lots of the scented laundry detergents make me itch, but so far Mrs. Meyer’s has been great! I bet you’ll like it too. I would definitely order if they shipped to Canada ;-) Please update us if they ever start. Happy New Year!! So sad… no shipping in Canada ! :( I would have ordered for sure ! Love ePantry! Their Grove Collaborative glass spray bottle is amazing! I’ve had my eye on that but worry I’ll break it within 45 seconds of opening it! Just ordered a bunch of stuff! What a great deal! Thank you for sharing :) I got your book for Christmas and I am LOVING it!! you are so welcome! So happy you are enjoying the book!!! what does the blood orange smell like? have you smelled the vanilla sandlewood? Oh! We just did our annual scrub those white cabinets day. I need that dish detergent, I don’t own a dishwasher. Happy New Year! I just ordered! I picked all Mrs. Meyer’s cleaning products. It should stock me up for a while. Thanks for sharing! Ordered! I am excited to try this service. It sounds like exactly what I need! Thanks also for the candle recommendation… I ordered one, as well. I love finding new candles! I just ordered! I’m so excited about the blood orange candle and I really hope I win the book- I’ve been wanting to read it and purge!!! I was so excited to see that they carry my favorite Molly’s Suds All Sport laundry detergent. Just placed my first order! Thanks for the suggestion! I use Mrs. Meyer’s countertop cleaner (lemon verbena). Works beautifully on my granite. Looking forward to trying some new items and getting some free goodies! I love epantry and very appreciative of you intro-ing it on your site. Thanks! Happy and Blessed 2016! Thank you! Great offer! Sharing your link with my friends! I just ordered my first produces. They look great. I am very interested in products that are non toxic and work great. Thanks for sharing such a great new service. I just had the chance to read your sweet book–how I loved it! It was crazy how much of it resonated with me. We’ve lived in a one bedroom for the past (!!!) 9 years (though not the same one bedroom apt.–4 different ones!) and I could completely relate to so many of the feelings you shared in the book. Thank you for writing such an honest, relatable book! I loved it, I really did. And meanwhile, I popped over here to check out your blog since I had never been and lo! 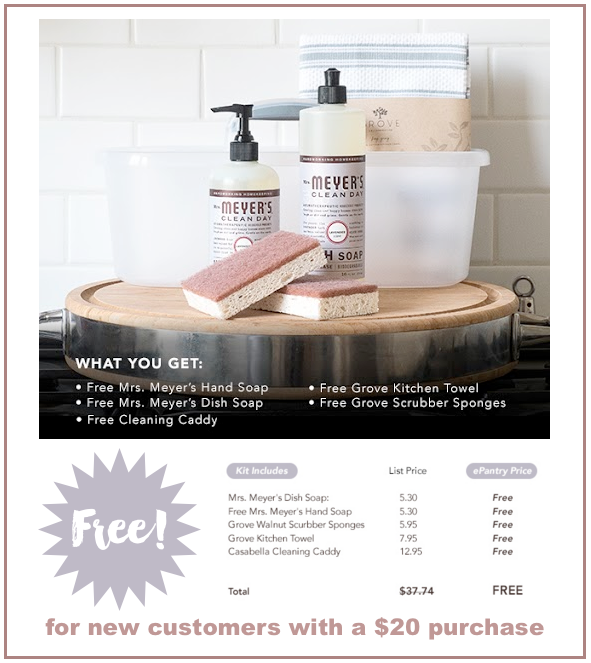 An amazing deal to get all my favorite Mrs. Meyer’s cleaning stuff! I hope I am lucky enough to get a surprise book…!!!!! yippie!, this is such an encouragement. And you live in a ONE bedroom!! My hero, Sarah! Ordered mine along with some extra towels and other cleaning products. Great offer! Never heard of epantry but seems like a great service, willing to try them out, Placed my order and had to grab a blood orange candle too, Thanks for the suggestion. My husband would be happy to not have me in Target every week! Just ordered some cool cleaning stuff, really liked that site and the prices were great, & they emailed me back saying I GET A FREE BOOK… WOOHOO!! 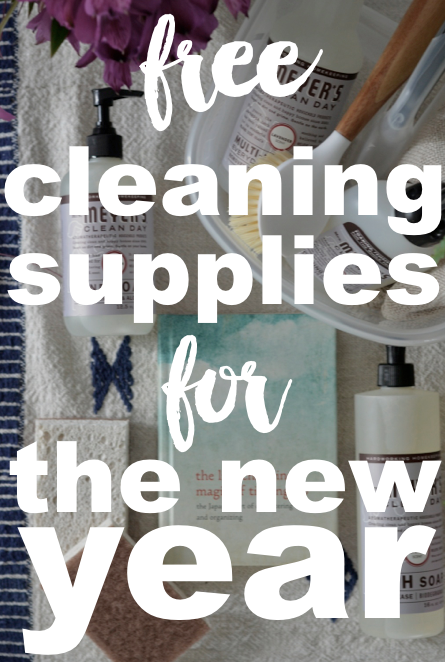 I don’t usually do this kind of thing (order online from an unknown company) but since me and everyone else is ringing in the New Year cleaning, de-cluttering, etc,, I thought I’d give it a try. Of course the offer of free goodies definitely got my attention! Looking forward to trying out the different Mrs. Meyers products and scents. I just wanted to thank you for sharing this great offer! I ordered cleaning products, new sponges and a scrub brush and I am completely in agreement with you that this service will save me from my usual expensive Target trips. My impulse shopping is the worst when I am in Target, haha. 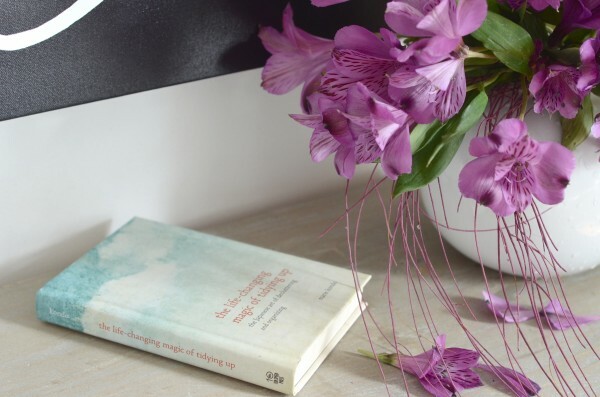 I am so excited that I am also getting a copy of The Life Changing Magic of Tidying Up, I never win anything so this is so my year is off to a great start!!! My receipt says to enjoy a free copy of the book, but it wasn’t included in my shipment? This is a great deal! My neighbor has the full cleaning kit from Mrs. Mayer’s and she is really happy with them! I definitely want to have them for the beginning of my spring cleaning routine! :) Thanks for sharing! Mrs. Meyer cleaning kit is good. My neighborhood rate cleaning kit 4.5 stars. She talks me she very like this kit. wow, glad to see this back.